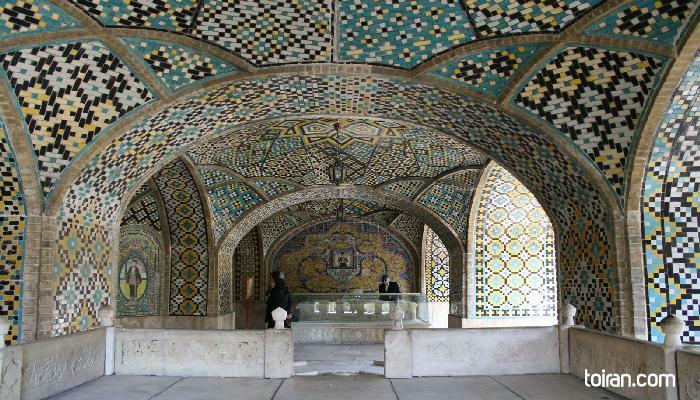 Golestan Palace or the Rose Garden Palace is a masterpiece of Qajar era (1785–1925) crafts and architecture and the place where traditional Persian arts meet European architecture. 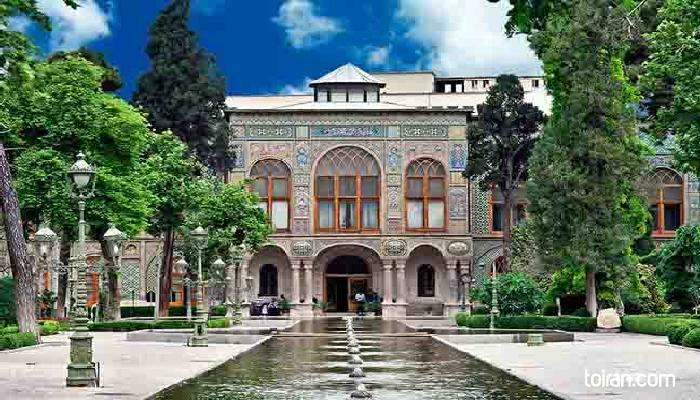 The palace was originally known as the Arg of Tehran and was built during the reign of the founder of the Safavid dynasty, Shah Abbas I (1571-1629). It found importance after Agha Mohammad Khan (1742-1797), the first of the Qajar Kings, chose Tehran as his capital and resided in this palace. The palace has some of the finest examples of Persian mirrorwork, stucco and stained glass decorations and consists of 17 palaces, museums, and halls, which were mostly built over the two centuries of Qajar rule. These halls include Talar-e Berelian (Brilliant Hall),which is famous for its mirrorwork and chandeliers, Talar-e Adj (Ivory Hall), which housed gifts by European monarchs to Nasser-al Din Shah, Talar-e Aineh (Hall of Mirrors), which is famous for its exceptional mirrorwork and once housed the Peacock Throne, Talar-e Almas (Diamond Hall), which is also noted for its glittering mirrorwork, and Talar-e Salam (Reception Hall), which was built and used by Nasser-al Din Shah as a museum that housed jewels . Khalvat-e Karim Khani (Karim Khan Veranda) was built in 1759 by the founder of the Zand dynasty (1750-1794) and was part of his residence. This nook has a marble throne and the tomb stone of Nasser-al Din Shah, which was originally located in Shah-Abdol-Azim Shrine in Rey and was moved and installed here after the 1979 Islamic Revolution. The iwan (a rectangular hall walled on three sides and open on one side) of Takht-e Marmar (Marble Throne) dates back to the reign of the founder of the Zand Dynasty, Karim Khan (1705-1779), and is the oldest part of the Golestan Palace Complex. The iwan is where the coronation of Qajar kings and Pahlavi kings (1925-1979) were held and where the Qajars gave audience to their subjects. On this terrace in front of the complex sits the magnificent marble throne, which was built upon the order of Fath-Ali shah Qajar in 1806. The throne is made of 65 pieces of marble from the mines of Yazd and crafted in Isfahan. The throne is inspired by the story of Solomon whose throne was said to have been carried by fairies and other supernatural beings. The 26-meter tall Emarat-e Badgir (wind tower monument) is located in the eastern part of the compound and has elaborate blue, yellow and black tile decorations. 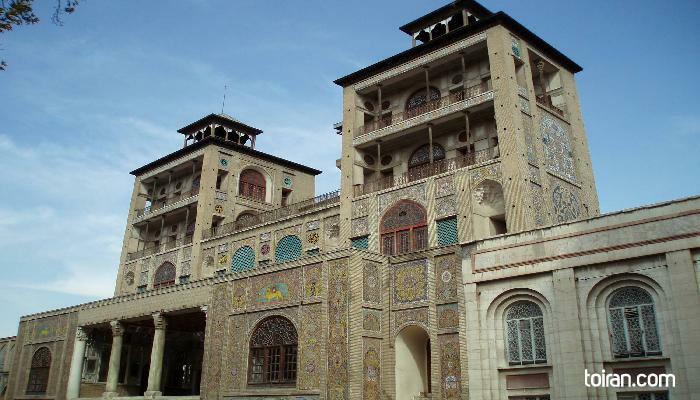 Shams-ol-Emareh (Edifice of the Sun) is a fusion of Persian and European architecture and was built upon the order of Nasser-al Din Shah to give the Qajar monarch a panoramic view of the city. This palace complex is a UNESCO World Heritage Site. Amazing art and interior decorations here, you can see a mix of Iranian and European architecture here. I don't understand the ticket sales here, they charge you separately for different sections, besides that it is definitely worth visiting. Love this place, it's a beautiful mansion with a large garden and amazing buildings inside, however, at the gate when you want to enter you have to buy 10 tickets if you want to see it all and there are different prices for the buildings really ridiculous.